This year, for the 13th time, World Kidney Day captured the world’s attention on the second Thursday of March (March 8, 2018). 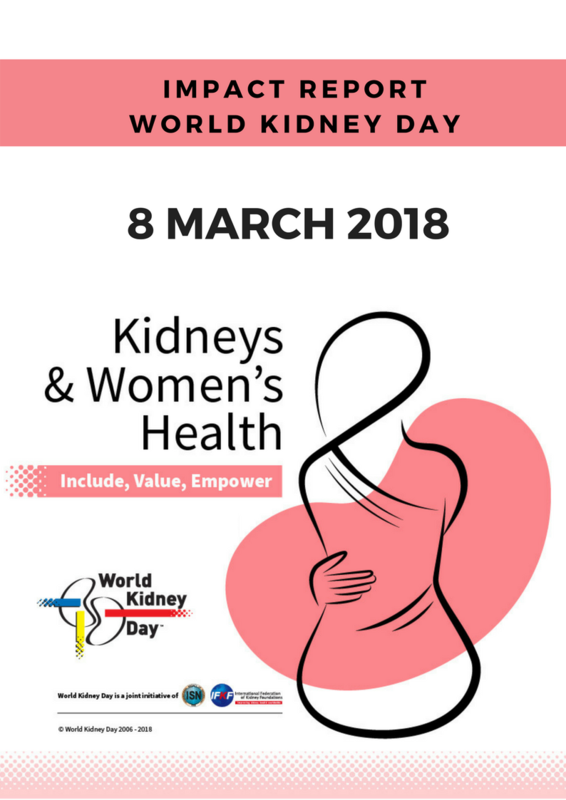 March 8 is also known as the International Women’s Day, which gave us an opportunity to highlight the importance of women’s health, as well as focus on the challenges that women face in relation to their kidney health. The world came together to celebrate women and kidney health, Global Impact Report WKD2018 takes a look at some of the actions and how the collective efforts this past 8 March made a reverberant impact worldwide. Global Impact Report WKD2018 takes a look at some of the actions and how the collective efforts this past 8 March made a reverberant impact worldwide. Thanks to all World Kidney Day 2018 Supporters & Champions! The global report provides a vague summary of the overall impact of World Kidney Day 2018, as we could not possibly cover in detail all the generous individual and collective efforts that took place this past March 8. However, we are happily sharing regional reports that our champions kindly provided us with. Please take a look at the PDFs to have a better understanding of activities organised in various regions. WKD 2018 – Spain S.E.N. Thank you to our official World Kidney Day corporate contributors , whose generous financial contribution enables us to carry on. Keep up to date with World Kidney Day news by signing up to receive our emails. We only send about six to eight a year, and promise not to share your details with anyone else. Thanks!